In 2015, from June to November, the Dorothy A. Johnson Center for Philanthropy at Grand Valley State University conducted its fifteenth annual VoiceGR community survey. On March 3, 2016, Grand Valley released the results of the survey, clearly gauging public opinion, attitudes, and perceptions about various aspects of the Grand Rapids community in words, bar graphs, and an easy-to-use interactive map. “We want the information to be comprehensive and representative of our community, in addition to being as accessible as possible, for everyone to use,” said Dr. Jodi Petersen, director of the Community Research Institute at the Johnson Center for Philanthropy and lead researcher of the VoiceGR survey. The Voice GR survey connects demographic information to various topics, measuring public opinion on everything from ability to meet basic needs, education, and racism in the city. One area studied in the survey is city resident’s perception of Grand River water quality. Another is how much of a priority citizens consider the issue of water quality. People who indicated pollution in the Grand River and its tributaries as an issue of priority were generally concentrated in neighborhoods in the north end of the city, with several in the southeast end. Additionally, particularly high ratings came from Lake Eastbrook, with 91.7 percent of respondents rating the issue as a priority, and Millbank with 88.2 percent of respondents rating pollution as a priority. And the neighborhood with the greatest proportion of respondents, with 100 percent rating water pollution in the Grand River and tributaries as a priority, was Fulton Heights. According to survey results, residents of neighborhoods located further upriver, like the Comstock Park area, and neighborhoods south of the Grand River felt that water quality was less of a priority than residents in neighborhoods located closer to downtown Grand Rapids. As for how people perceive the quality of the Grand River’s water, the highest rating, or excellent, was given by 20 percent of respondents in Lake Eastbrook, and by fewer than that in every other neighborhood. Interestingly, Lake Eastbrook was also one of the neighborhoods that most considered pollution in the Grand River and tributaries a priority—with 91.7 percent of respondents rating it as such. 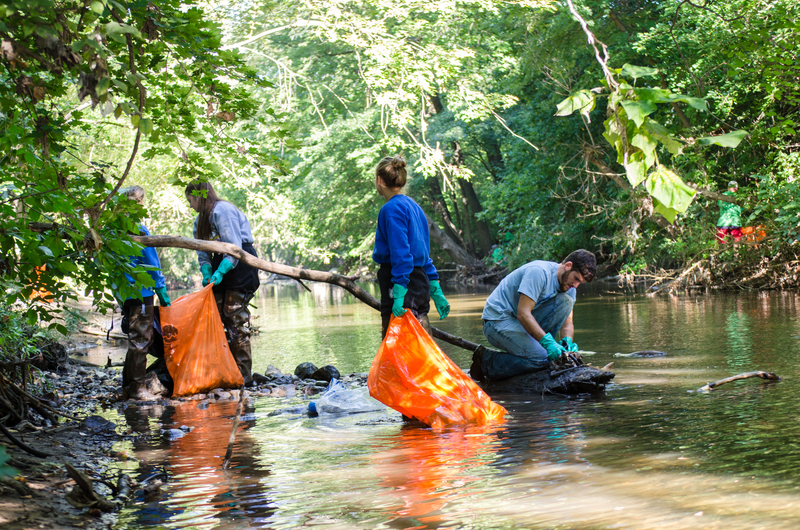 Michael Ryskamp, Program Coordinator of Plaster Creek Stewards, suggests that proximity to a vulnerable water body encourages residents to be not only aware of its properties, but also to care about them. Plaster Creek, one of Michigan’s most polluted bodies of water, flows through the Lake Eastbrook neighborhood, which may suggest why such a high percentage of Lake Eastbrook residents stated pollution as a high priority; this data seems to conflict, though, with Lake Eastbrook’s simultaneously high percentage of people rating the Grand River’s water quality as excellent. The most common ratings of the Grand River’s water quality, split by neighborhood, were “good” or “fair.” The lowest rating, “failing,” was given by, at most, 17 percent of respondents, which was the case in the Black Hills neighborhood. “We are interested to see whether people’s concerns about water quality will change this year, particularly since water quality has become an intimately crucial issue to Grand Rapids’ neighbors in Flint,” Petersen said. She surmised that opinions may differ this next year, as people begin paying closer attention to water quality. And as the Rapids Restoration plan moves forward, water quality will continue to remain in the spotlight.